We are committed to excellence and honesty. 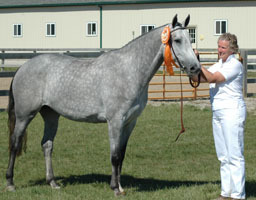 Claybrook Farms breeds and trains Dutch Warmblood sport horses for the discriminating buyer. We breed with only the top 4-5% of Dutch Warmblood stallions (e.g. Indoctro, Corland, Ahorn, Goodtimes, Karandasj), who demonstrate the best conformation, gaits and show jumping ability, and who have a history of passing desired traits to their offspring. Our farm purchases and retains only the very best mares (primarily Keur mares, with some exceptional ster mares) from top bloodlines that have produced approved stallions and international competition horses. Our focus is on breeding and training very high quality Dutch Warmblood show jumping, equitation and hunter horses. When you produce high quality horses, some clearly demonstrate an interest in dressage rather than jumping. 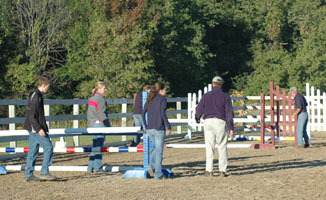 We accept this interest and try to help our horses realize their greatest potential, whether jumping or dressage. We value greatly the contribution that a well-designed training program can make to improve the abilities and attitudes of the young horses. Our training program physically and mentally conditions our horses to be willing and strong performers in the competition arena. To demonstrate the true potential of our horses, we prefer to sell horses that have completed about two years of training and one year of competition. Claybrook Farms (CBF) is located in the central part of Michigan, about 30 minutes north of Lansing. The farm is owned and operated by the Pihl family. The farm sits on a 300-acre parcel owned by the Pihls, which consists of 140 acres of fertile rolling farmland on which we run and grow our young stock, and broodmares. We raise our young stock in a small herd with lots of opportunity for free ranging outdoor activity. Raising our young stock on the undulating terrain builds strength and stamina and creates co-ordination. CBF was established in 2001 with the aim of developing a high quality breeding and training program. We wanted to establish a moderate sized farm that produced horses on par with top European horses. We hope that our farm will allow US buyers to avoid a trip to Europe and the trauma of shipping and quarantining their horse. Our six foundation mares (four Keur and two ster mares) were purchased in the Netherlands with the assistance of the renowned VDL Stud in Holland. Susan Taylor and Waino Pihl — Susan and Waino, who own Claybrook Farms, grew up in the Central Michigan area, but lived in Detroit and Chicago for almost 30 years. Susan plays a major role in the breeding and caring for the mares and foals. She spends many nights during breeding and foaling season living in the barn apartment. Waino enjoys studying genetics, nutrition and training. He also works on the purchases and sales of horses, as well as supervising the care of facilities and pastures. On weekends you can find Susan and Waino spending their mornings working with the barn cleaning crew. Waino and Susan have two children (Kari and Dane) who are learning and helping with the business.